This time last year we were all sitting in anticipation waiting for the release of the new Star Wars trilogy. This year Lucasfilm brings us the first “standalone” film, Rogue One: A Star Wars Story. In just a few words this film fits like a puzzle piece between Episode III and Episode IV. In the first trilogy reboot we end in Episode III (Revenge of the Sith) with Darth Vader and the Emperor overseeing the construction of the Death Star. Padmé has died at the hands of Palpatine, and Luke and Leia have been hidden in the corners of the galaxy. This is where the Rogue One puzzle piece fits! This all new adventure follows a band of rebels as they set out to steal the plans to the Death Star. We all know this as the Empire’s ultimate weapon of destruction from the original trilogy. In a New Hope (Episode IV) the plot picks up with the Rebel Alliance, lead by Princess Leia, as they attempt to destroy the Death Star. Rogue One fills in important plot point gaps between the trilogy reboot and the original trilogy. Other than the timeline to help you piece together where Rogue One: A Star Wars Stories fits into the trilogies and my perspective as a parent (find below) I’ll leave you with the answer to the two questions my husband had after I screened the film yesterday. It was AMAZING! 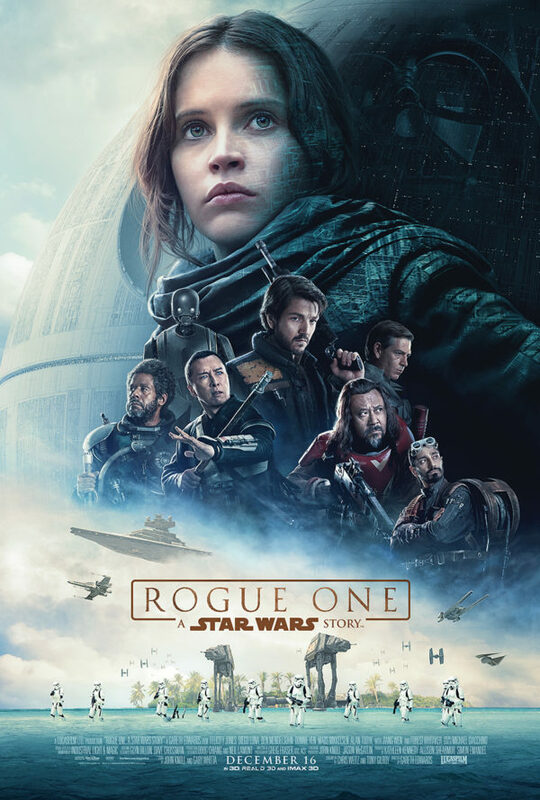 Rogue One earned it’s right to have Star Wars in the title. I loved it visually. More akin to the newest installment or the original trilogy. Lots of great action scenes, suspense, and overall a great film with amazing entertainment value. Star Wars fans will not be disappointed. Some fun dry humor and just a few moments of unnecessary use of CGI I think the film could have done without, and the storyline would’ve benefited from their omission. Was it better than Episode VII? I’ll leave that one up to you. It’s definitely up there for me, but I’m still on a high from seeing the film and all its newness. It was visually stunning, the musical score was amazing, and the action kept me at the edge of my seat. One of the biggest reasons I wanted to screen the film was to get a sense of what age it would be appropriate for. As this film is being marketed as a standalone film I wasn’t sure what to expect in regards to intensity, gore, violence, etc. We already bought tickets for the entire family to see the first showing on Thursday with our close friends. My oldest (7) is a movie buff and for the most part does well with films. He’s only covered his eyes in 2 movies and asked me tell him “when it was over” because it was too intense. My youngest (4) seems to be a little bit more anxious with most everything with the exception of movies. With that said I feel comfortable taking both my boys to see it in the theater. They have watched The Force Awakens multiple times with no issue. So, if your kids are Star Wars fans and have seen the other films, I think they’ll do okay. I don’t normally make a blanket statement, but using last years installment as a gauge there’s nothing more intense or graphic. If this is your kid’s first live action or Star Wars experience in theaters I’d suggest previewing the movie first. But that’s okay because you’ll want to catch it again while it’s in theaters. | Instagram| You Tube or visit the official Rogue One: A Star Wars Story website.